Kawa, Guimaraes & Associates Solicitors, a recently established firm of solicitors in Holyhead, have opened a sister company in prestigious premises at One Canada Square, Canary Wharf, London. Mehedi Rahim and Kate Kawa, founders of Kawa, Guimaraes & Associates.The company was established by entrepreneurs, Mehedi Rahim Kate Kawa. Kate is the CEO & Managing Partner, while Mehedi is the Senior Partner. The organisation deals with a wide range of legal issues including family, immigration, contract, tort, litigation, Islamic finance and employment law but with the added specialism of international law. 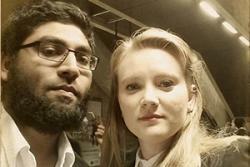 Mehedi Rahim is a PhD student in his final year researching Islamic Law and UK Marine Insurance at the Law School and Kate is an MBA graduate of Bangor Business School. Both overseas students are professionally qualified and between them have considerable experience of working hands on with clients and litigation. They realised there was limited centralised provision for those with specific legal issues that required knowledge and experience of international law – issues relating from immigration such as visas to international marine trade. The partners have experience of working for a large bureaucratic corporation and were keen to escape this environment as they felt it had a sluggish approach to decision making which discouraged creativity and innovation. Coming from entrepreneurial families they had the idea and impetus to consider starting up independently rather than re-joining a large organisation. With all this experience they set about conducting market research as well as developing their enterprise skills through the support available at Bangor University to help turn their dream into a reality. The workshops and mentoring support were available free of charge to the Mehedi and Kate through the Welsh Government North West Wales Regional Hub and Graduate Start Up Support and HEFCW’s Enterprise Support Programme. The biggest challenge for the partners was in obtaining the licensee from the authorizing body the SRA and the professional indemnity insurance for a law firm. With so many law firms in the UK losing their license each year this was a major obstacle to overcome. The pair now enjoy the advantages of benefits of being self employed including managing their own time, financial independence and inspiring others. They are also know the realities of long hours, variable income and risk taking but firmly believe that the advantages outweigh the disadvantages if you are doing what you love. They would argue that preparation is everything and that lack of preparation is the reason why so many new start ups fail to survive within five years of trading. Mehedi and Kate are keen to ‘give back’ to Bangor University by providing opportunities to other Bangor students. Mehedi said of this aspiration ‘… as we went through this process ourselves we know how it feels. We want to give others the opportunity to acquire the necessary experience that is so difficult to get in this field’. Read more about their new venture at - www.facebook.com/kgna.co.uk and recently launched web site .